ArtLifting gives artists a platform to show their talents. She discovered that a lot of the quality art being produced at these places was being thrown away or left to collect dust. Powers co-founded ArtLifting—the name combines the words art and uplifting—to give these artists a platform to show their talents. “By allowing these artists to showcase their talent to a national audience, ArtLifting gives them the opportunity to be successful on their own merit. 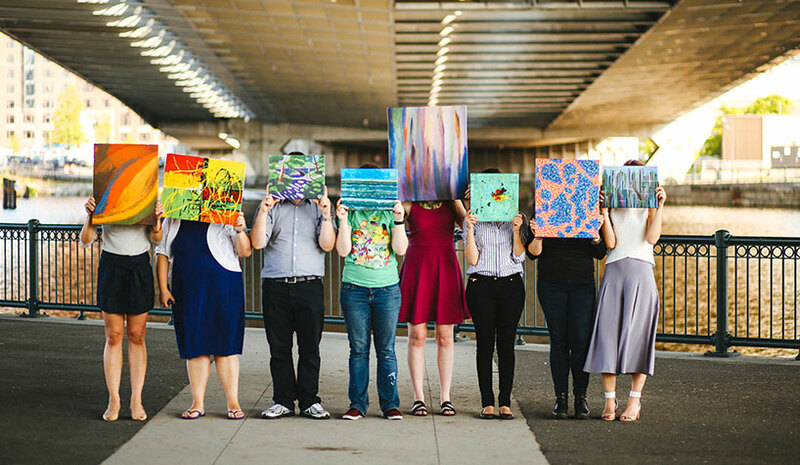 ArtLifting is a company that empowers artists facing homelessness and disability through the sale and celebration of their artwork,” said Powers. After launching the organization with $4,000 of her own savings just four years ago, ArtLifting has expanded to 20 states nationwide. The organization has received a fair amount of press, and word of mouth also helps to spread awareness of Powers’ work with populations in need of support. With each sale, artists make 55% of the profit, enabling them to make an income with their talent. “We measure ArtLifting’s impact in two ways: the amount of money our artists earn and the change in their levels of confidence. We measure the confidence change both qualitatively and quantitatively through a survey,” she said. Powers explained that she is always thinking about how ArtLifting can become more efficient and exponentially expand its impact. “One way we are doing that is connecting with commercial interior designers nationwide so they can share our story and beautiful artwork and wallcoverings with clients,” she said. In this work of service and helping others, there have also been moments of awe for Powers: when she met artist Eric Santamaria and saw him paint with his wheelchair, or when artist Scott Benner gained housing. “Just this past week, we had an amazingly memorable moment. We created an internal Facebook group where ArtLifting artists nationwide could share hopes, fears and artwork with each other. Within hours, 30 artists had joined, supported one another and complimented their new artwork. They encouraged each other to keep pushing,” she said.